In its simplest definition, freedom of navigation refers to the free movement of ships from country to country for the purpose of trade or other peaceful activities. It is the key principle governing global trade. Unfortunately, not every country grants vessels the basic right of free movement. Many impose restrictions to limit free navigation especially within their territorial waters. Some like Peru and Nicaragua have excessive territorial claims, with boundaries extending to 200 nautical miles, far beyond the internationally agreed 12 nm limit. Others claim entire geographical zones as their internal waters, an example would be Libya with its stake on the Gulf of Sidra. However, all these excesses pale when compared to China with its claim on almost the entire South China Sea ( SCS ) as its sovereign territory. 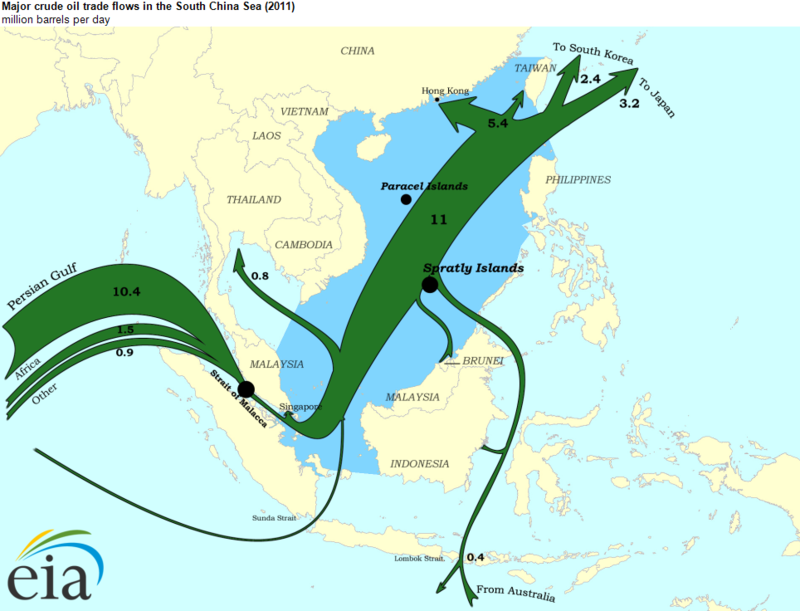 The arbitrary Nine-Dash Line drawn by China almost completely covers the whole SCS with the southern-most line very close to the Sarawak shore in East Malaysia. That point is some 900 nm from Hainan Island, the closest internationally recognised Chinese land mass. Ignoring concurrent claims by other South East Asian nations bordering the South China Sea, China had also militerised the entire area by garrisoning troops on reefs and by conducting regular patrols of the contested zone with naval and coast guard vessels. Foreign fishing vessels have been detained, survey ships exploring for oil have been harassed and even foreign warships have been warned to stay away from occupied areas. Skirmishes flare up very once in a while and have lead to fatalities, the most serious happened on Johnson South Reef in 1988 resulting in the death of 64 Vietnamese soldiers. In the past two and a half years China had up the ante with the commencement of massive land reclamation at multiple reefs in the Spratly Islands creating artificial islands complete with infrastructure for long term military and civilian occupation. Faced with such naked aggression and shameless land / sea grabbing, most of the smaller maritime nations around the SCS like Vietnam, Malaysia and Brunei, with the exception of the Philippines, have so far managed only muted responses. Nobody seems to have the courage to even verbally challenge China on its errant behavior. This could be because China is among the top trading partners for many of these countries and is also a military super power on the rise. Not so for the United States. 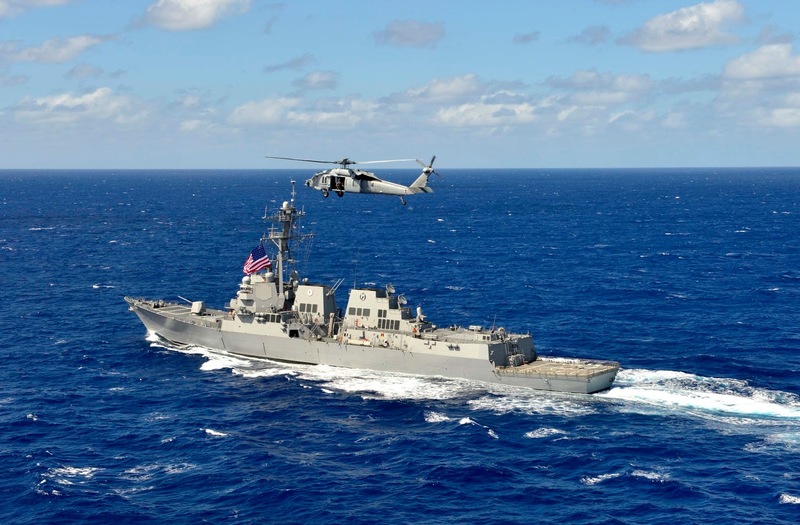 Although not party to any territorial claims in the SCS, the US have long held military and commercial interests in the South China Sea that would require guarantees of freedom of navigation for its ships and aircraft. 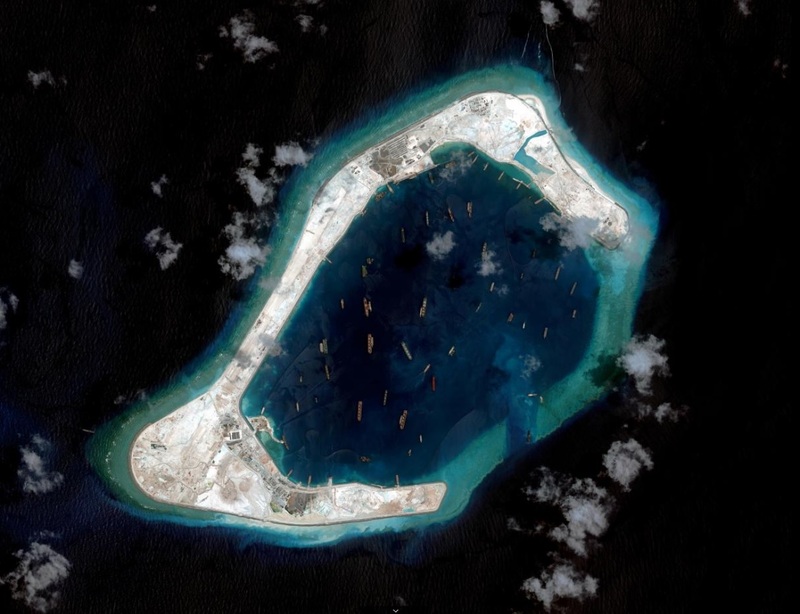 After much hand wrangling and delays, the Obama administration had finally launched a Freedom of Navigation operation ( FONOP ) to the Spratly Islands to assert America's navigation rights against China's territorial claims. On 26th Oct 2015, amidst heightened tensions in the region, USS Lassen, an Arleigh Burke-class guided missile destroyer, sailed within 12 nm of Mischief Reef and Subi Reef. A Chinese destroyer shadowed the American warship but it was allowed to complete its mission without an incident. Needless to say, the operation generated worldwide attention and provoked angry Chinese respond. takes off from Eielson AFB, Alaska for Ex. Northern Edge 2009. USAF Photo. Less than two weeks later, on the night of 8th / 9th Nov, a pair of B-52H strategic bombers from Guam overflew the Spratly Islands though never closer to 15nm of Chinese claimed territorial waters. They were contacted by Chinese ground controllers but again were allowed to continue with their mission undeterred. That second American foray into the South China Sea generated just as much Chinese condemnation but considerably less media attention elsewhere. On 30th Jan 2016, the USN conducted another FONOP in the South China Sea with the destroyer USS Wilbur Curtis which sailed to within 12nm of Triton Island of the Paracel group. 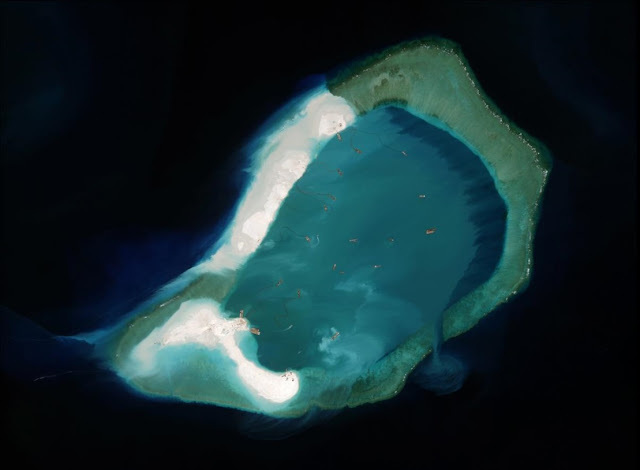 Triton Island is also claimed by Vietnam and Taiwan, and unlike the first FONOP which took place at a newly created artificial island, this was a location that China had occupied for more than forty years, since it seized control of the Paracels from South Vietnam in 1974. The most recent mission occurred on 10th May when the destroyer USS William P. Lawrence sailed to within 12nm of Fiery Cross Reef of the Spratly Islands, where massive land reclamation and a 3000m airstrip had been built by China in the past year. The United States is likely to continue such freedom of navigation passages periodically in the SCS unless claimant states to the disputes reefs and islands, primarily China, back down from their excessive sovereignty claims. FONOPs in the South China Sea from the Sputnik News perspective. Since 1979 the US Government has established the Freedom of Navigation ( FON ) Program which is jointly administered by the Department of State and the Department of Defense and administered by the US Navy, to periodically challenge countries with excessive maritime claims through peaceful means. According to the US Department of State, the FON Program provides that the United States will exercise and assert its navigation and overflight rights and freedoms on a worldwide basis in a manner that is consistent with the balance of interests reflected in the Law of the Sea (LOS) Convention. It adopts a three prong approach which involves not only diplomatic representations and operational assertions by U.S. military units, but also bilateral and multilateral consultations with other governments in an effort to promote maritime stability and consistency with international law. It stresses the need for and obligation of all States to adhere to the customary international law rules and practices reflected in the LOS Convention. The program has so far challenged more than 40 countries on their excessive maritime claims. The Department of Defense's list of FON annual reports from 1991 to 2014 can be found here. Why are such FONOPs necessary in the SCS? Well its mainly because of the trillions of dollars of trade passing through the SCS annually that is potentially at stake. It is also a clash of two global powers, one incumbent and another newly minted who does not seem to know how to behave or what to do with its new found powers on the world stage. 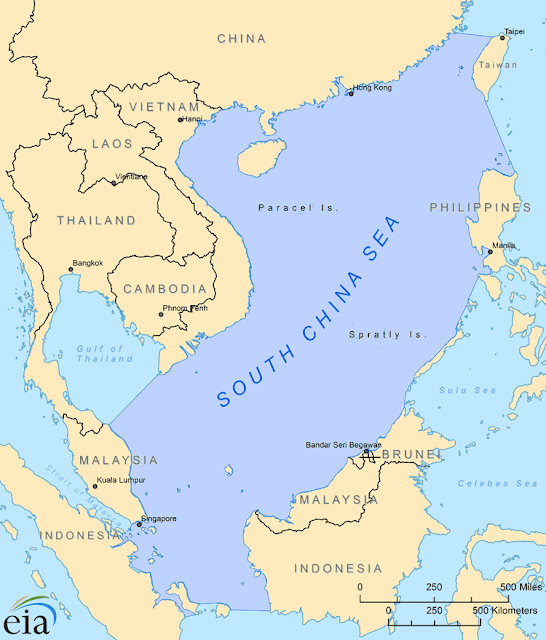 The South China Sea, an area of open water in the Western Pacific Rim spanning some 3.5 million square kilometers in size, is home to several historically uninhabited island groups comprising mainly of small islands, rocks and reefs that have long been the subjects of dispute in sovereignty, many with overlapping claims by several nations at the same time. The South China Sea ( purple area ) and surrounding land masses. It is one of the most important energy trade routes in the world. 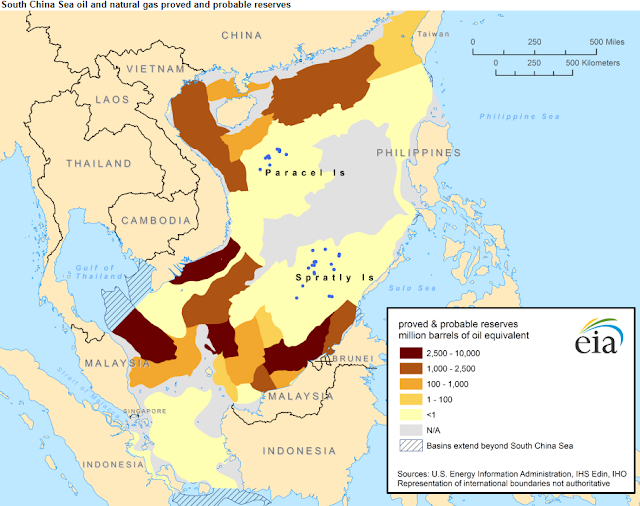 Strategically, it could not have been more significant that almost a third of the global sea-borne crude oil and about half the global liquefied Natural Gas ( LNG ) passes through the South China Sea each year. It is also one of the most important international shipping route with more than half the world's annual merchant fleet tonnage worth an estimated 5.3 trillion US Dollars passing through it yearly. By some reckoning its importance surpasses even those of the Suez and Panama Canals combined. 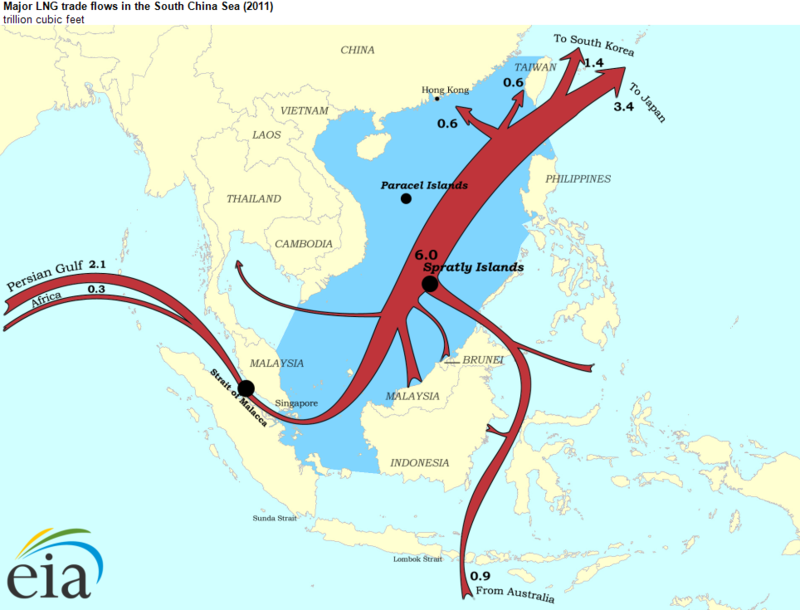 most would continue through the South China Sea to East Asia. crude oil. This 2011 estimate by US EIA. 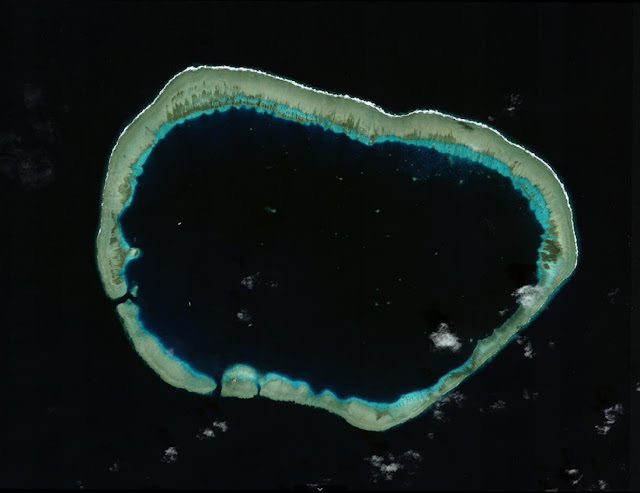 Even though in their original state many of the disputed territories are small atolls or merely rock outcrops or semi-submerged reefs unsuitable for sustained human habitation, maritime nations surrounding the South China Sea declare ownership of those tiny parcels of land simply to lay claim to the surrounding seas and its natural resources. Based on a US Geological Survey ( USGS ) study conducted in 2010, the US Energy Information Administration ( EIA ) estimated that there could be 11 billion barrels of oil reserves and 190 trillion cubic feet of natural gas in proven and probable reserves. As the USGS assessment did not cover the entire region ( for obvious reasons, think China occupied territories ), undiscovered resources could be greater. In fact, in 2012 the Chinese National Offshore Oil Company ( CNOOC ) had unverified estimates of 125 billion barrels of oil and 500 trillion cubic feet of natural gas for the region. And we have not even mentioned anything about fisheries yet. ( darker brown areas ) are ironically in uncontested or less disputed zones!? Some of the major island groups and features in the South China Sea. China claims almost the entire South China Sea as its own territory, a large chunk of the 3.5 million square kilometers of open seas and numerous reefs and islands. The claim is largely historical based which is generally not provided for under international agreements like the United Nations Convention on the Law of the Sea. It all started in May 2009 when China communicated two Notes Verbales to the United Nations Secretary General objecting to Vietnam and Malaysia's joint and individual submissions to the Commission on the Limits of the Continental Shelf. It stated " China has indisputable sovereignty over the islands in the South China Sea and the adjacent waters, and enjoys sovereign rights and jurisdiction over the relevant waters as well as the seabed and subsoil thereof. The above position is consistently held by the Chinese government, and is widely known by the international community. " Widely known, mostly by poor nations that have been bought or bribed by China, like Cambodia, Laos, Zimbabwe, Sudan and other Banana Republics. Notes Verbales to the UN. That attached map ( shown above ), contained nine dashes that encircle islands, waters and other features of the South China Sea, encompassing some 2 million square kilometers of maritime space, equivalent to about 22% of China's land area. The dashes were by all intent and purposes hand drawn for all we know, since China had not published precise geographical co-ordinates for their positions. As we can easily see for ourselves, the dashes are not uniformly distributed. They are separated from one another by distances between 107nm to 274nm. Another striking feature about those darn dashes is that they are all extremely far away from the internationally recognized coastline of China but very near those of the littoral states around the SCS. For example the southernmost dash is approximately 900nm from Hainan Island, China but a mere 24nm from the coast of Sarawak, Malaysia. Worse, even the positions and numbers of those goddamned dashes are not fixed. 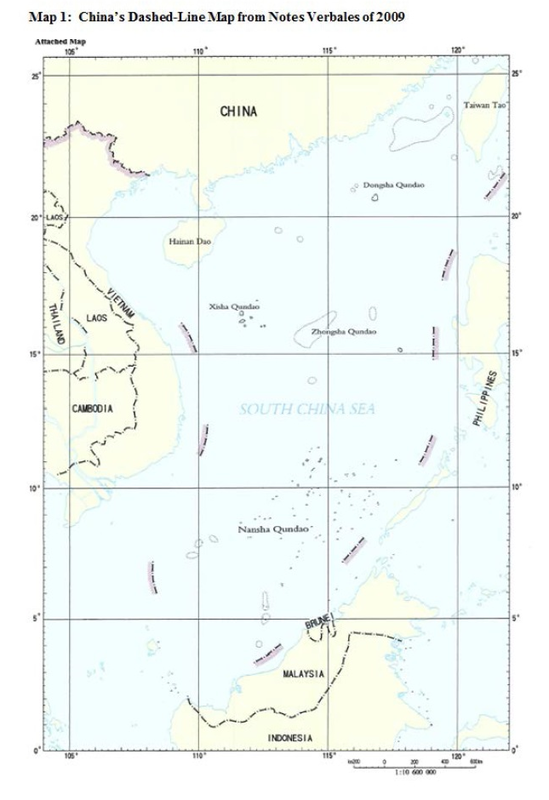 The 2009 map with 9 dashes was believed to have originated from a map published by the Republic of China in 1947 entitled " Map of South China Sea Islands " in which there were 11 arbitrary dashes. 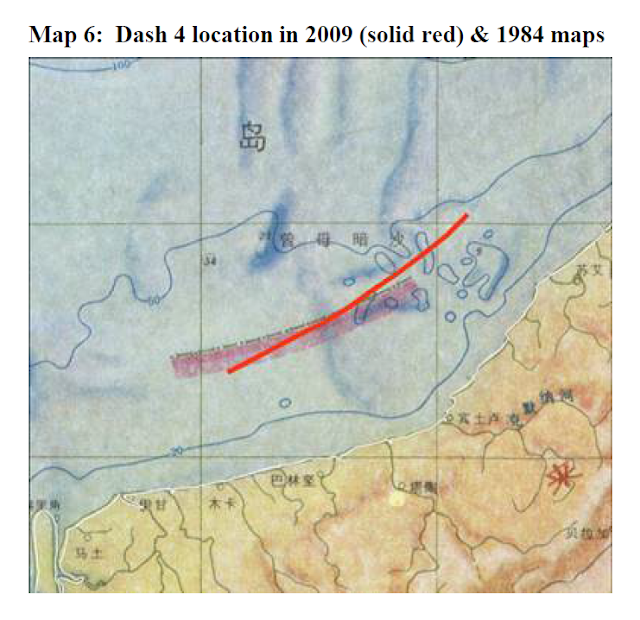 The next thing we knew, China added the 10th dash to a location east of Taiwan in 2013! How ridiculous could China be? the 2009 maps. The dashes were not numbered in the original maps. The tenth red dash appeared from 2013 onwards. 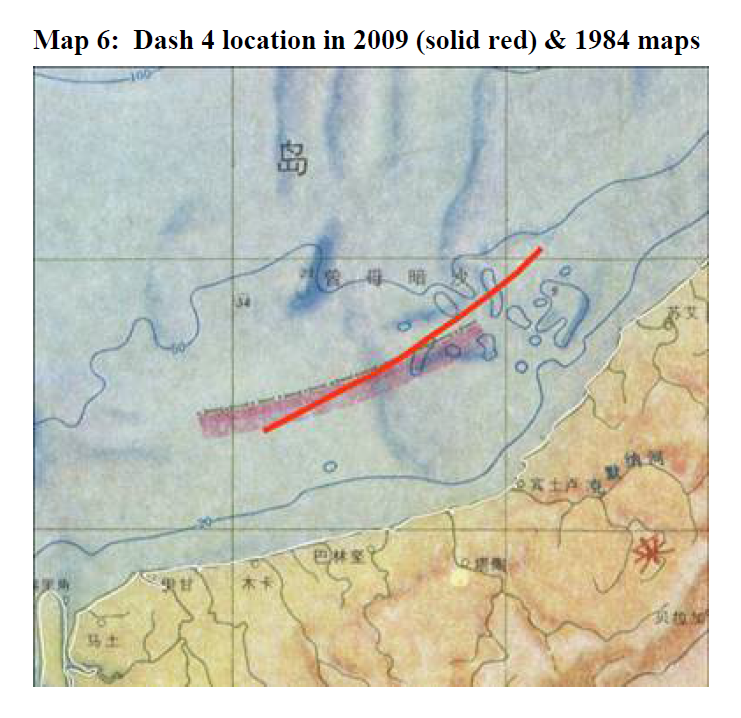 Comparing Chinese maps published over the years, it is also obvious that the locations of the dash lines are not fixed or precise and could vary by many miles. Shifting Dash : Lack of consistency between old and new maps. The dash lines as a claim to the islands, since it is not unusual to draw lines at sea on a map as an efficient and practical way to identify islands or groups of islands. That since China has sovereignty over the islands, it will be entitled to the usual territorial waters and the adjoining EEZ under the provision of the Law of the Sea. 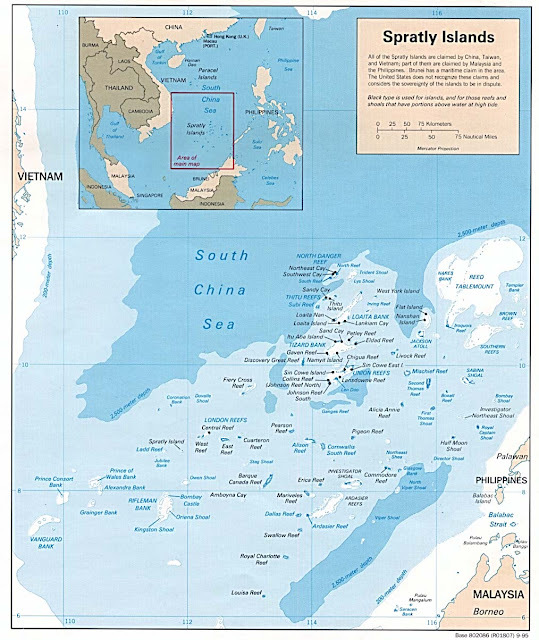 Problem was all those islands have disputed sovereignty and also China has yet to indicate which of those SCS features are islands and which are submerged structures and rocks which are not entitled to territorial waters and EEZ privileges. It has also been actively converting submerged reefs and low tide elevations into artificial islands to further complicate matters. The dashes indicate China's national boundaries. Indeed most recently publish Chinese maps use the symbol for national or international boundary no different from those indicating land borders to depict the dash lines in the SCS. The issue here is that international boundaries has to be established with the agreement of all parties involved and should not be unilaterally imposed or decided. The dashes may indicate a historical claim, as China had in 2011 issued another Notes Verbales reiterating its words regarding sovereignty of the islands but added the claims were " supported by abundant historical and legal evidence ". So it will be a somewhat lesser claim based on historical grounds that Chinese fishermen and tradesmen had plied these oceans for centuries, but so had the peoples of the littoral states around the SCS! So, whichever way it is, apart from what it is already entitled to under the Law of the Sea based on its mainland and Hainan Island coastlines, China's claim to ANYTHING in the SCS, be it islands, rocks, reefs or maritime territories is without legal basis, unwarranted and totally uncalled for, especially from an aspiring global power. Aileen S.P. Baviera PhD of the University of the Philippines. Baseline : The low-water line along the coast as marked on large-scale charts officially recognized by the coastal state. It forms the basis by which the various maritime zones are demarcated. Internal Waters : All enclosed bodies of water like lakes and rivers landward of the coastal baseline where the state has complete sovereignty. Right of innocent passage is not allowed. However, "archipelagic waters" within the outermost islands of archipelagic states like the Philippines or Indonesia is also considered internal waters and are treated as such with the exception that innocent passage has to be allowed but the state could designate certain sea lanes through these waters. Coastal Waters : Up to 3 nautical miles ( nm ) from the baseline of a coastal state. Traditionally, this was roughly the furthest reach of a shore battery. Territorial Sea : Up to 12 nm from baseline. The coastal state has sovereignty and jurisdiction over the water and airspace above it. Innocent passage is allowed only for surface vessels but does not extend to the national airspace above. Contiguous Zone : Waters extending from the outer limit of the territorial waters from 12nm up to 24 nm from the coastal baseline. A state can exert limited control for the purpose of preventing or punishing infringements of its customs, immigration, fiscal or other laws and regulations within its territorial seas. 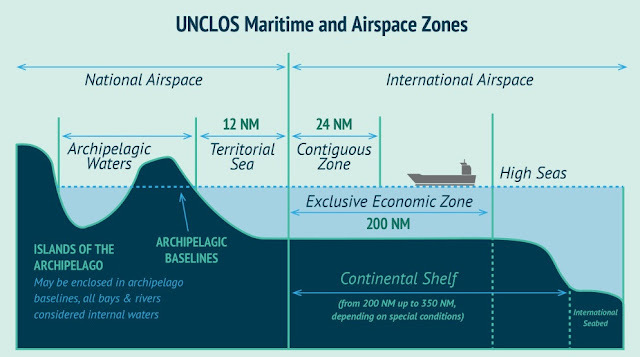 Exclusive Economic Zone : Extends from the outer limit of the territorial sea ( 12 nm from the baseline ) up to 200 nm. The coastal nation has control of all economic resources within its EEZ including fishing, mining, oil exploration and any pollution of those resources. The airspace above an EEZ is considered international. Continental Shelf : Extends to the outer edge of the continental margin and at the least 200 nm from the baseline if the continental margin does not extend that far. The outer limit is set at 350 nm from the baseline or not more than 100 nm from the 2500m isobath ( the line connecting the seabed which are at the depth of 2500m ). A coastal nation has control of all resources on or under its continental shelf, living or not, but has no control over any living organisms above the shelf beyond its EEZ. There are 3 main types of terrestrial objects are involved in maritime disputes and they again have different entitlements accorded. Island : A naturally formed land mass that is permanently above water that can sustain human habitation or economic life on its own. It's entitlement includes territorial sea, contiguous zone, EEZ and continental shelf. Rock : A land mass that is permanently above water but unable to sustain human habitation or economic life on its own. For example, no topsoil or lack of a permanent source of fresh water. It is entitled to a territorial sea and a contiguous zone but has no rights to an exclusive economic zone or a continental shelf. 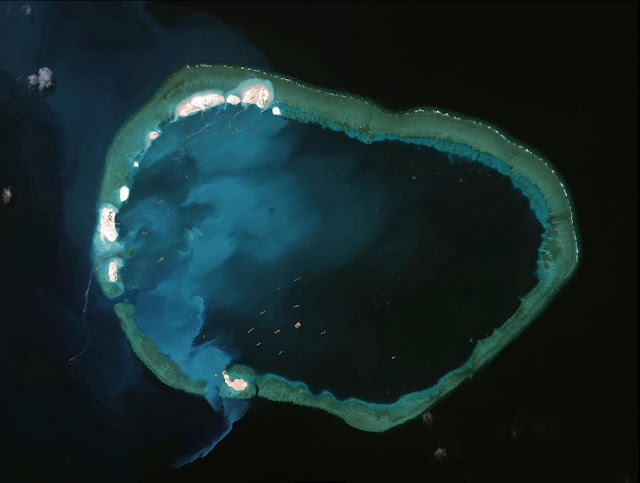 Johnson South, Cuarteron and Fiery Cross Reefs of the Spratly Chain were considered rocks in their natural states. Low Tide Elevation : An area of land which is surrounded by and above water at low tide but submerged at high tide. They maybe used as a basepoint for the calculation of maritime zones only if they lie within the 12nm territorial waters of an island or the mainland. Many of the disputed reefs in the Spratlys including Gaven Reef and Hughes Reef are included in this category. Mudflats, Shoals, sandbars and gravelbars belong here as well. Note that artificially created islands have no legal provision for any form of entitlements under the Law of the Sea apart from a 500m safety zone and rightly so. Otherwise anybody can build an island or islands and start excluding others from its maritime zones just like that. In dealing with the current situation in the SCS, we have to examine another issue and that is the creation of islands. The phenomenon of island creation at locations where there were previously none is nothing new. Mother Nature has done it on a constant basis ever since the formation of our Earth. They come in the form of new volcanic islands forged by tectonic forces from deep under the mantle of the Earth. 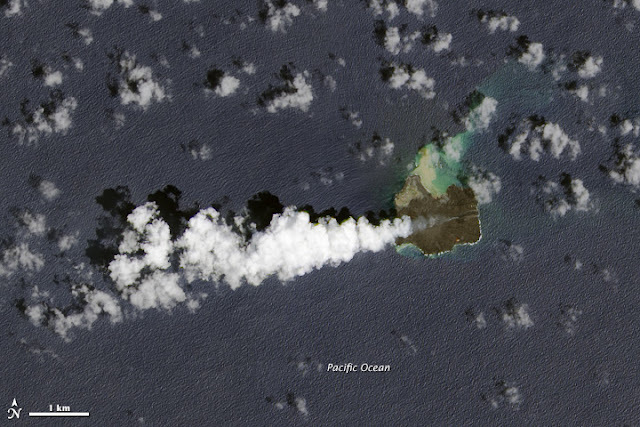 A recent example would be the new island Niijima which was created when an undersea volcano erupted next to Nishinoshima Island, part of Japan's Ogasawara Island Chain ( 小笠原群島 ), in Nov 2013.
larger neighbor Nishinoshima ( Japanese 西之島, literally West Island ) 500m away. 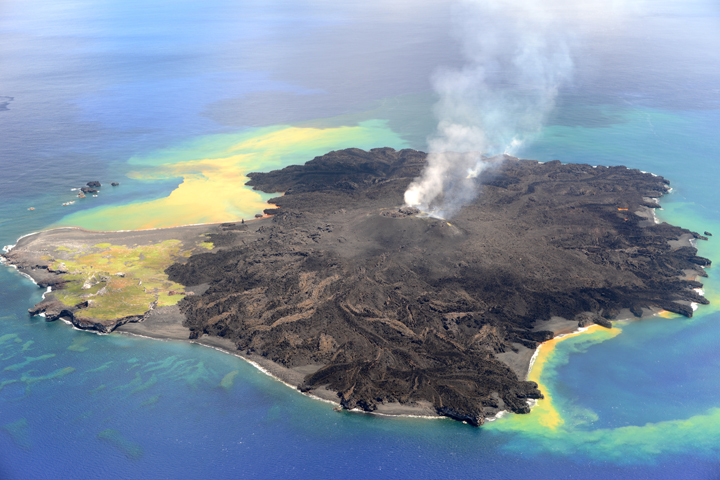 in this aerial view of the merged volcanic islands Nishinoshima on 26th Aug 2014. The video above was taken on 20th Nov 2013 by the Japan Coast Guard a week after the emergence of the new volcanic island. This video shows a cruise to Nishinoshima in 2016. Notice the elevation of the volcano above the sea level. Even man-made islands are nothing new. Advancement in civil engineering has now enabled human beings to not only to reclaim land from the sea but also to build islands for a variety of purposes. 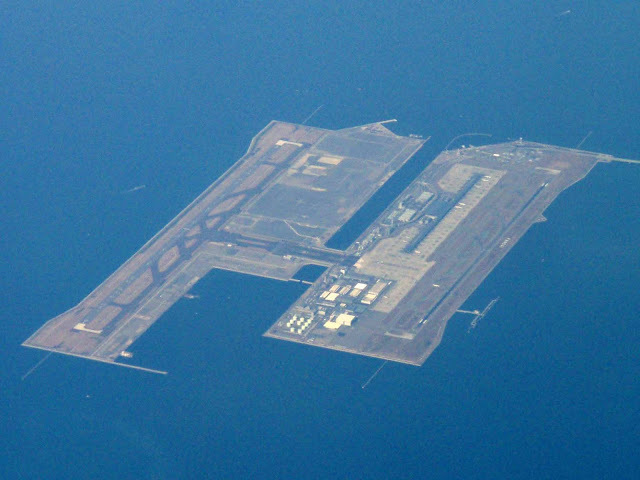 Osaka's Kansai International Airport ( IATA : KIX ), one of Japan's busiest airports serving close to 20 million travelers annually, is entirely built on an artificially created island in the middle of Osaka Bay. 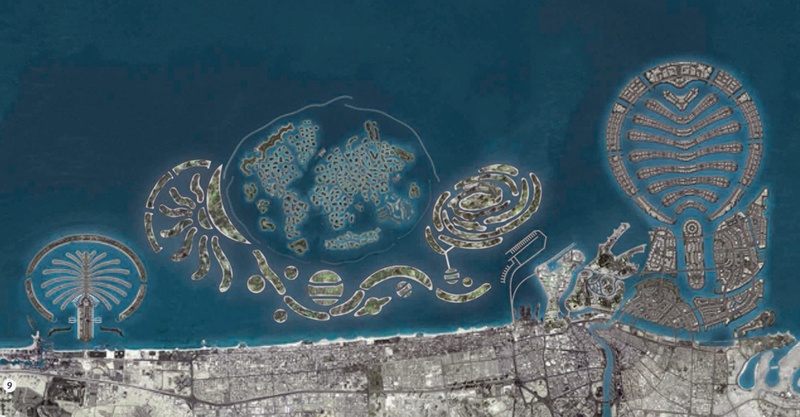 Half a world away in the Persian Gulf, the United Arab Emirates had also build several artificial islands including the Palm Jumeirah and Palm Jebel Ali in the shape of palm trees complete with trunk and fronds off the coast of Dubai to house the rich and the famous. Note that all these made-made islands are without exceptions all constructed near to land masses and are well within the 12 mile territorial waters of the host country that created them. 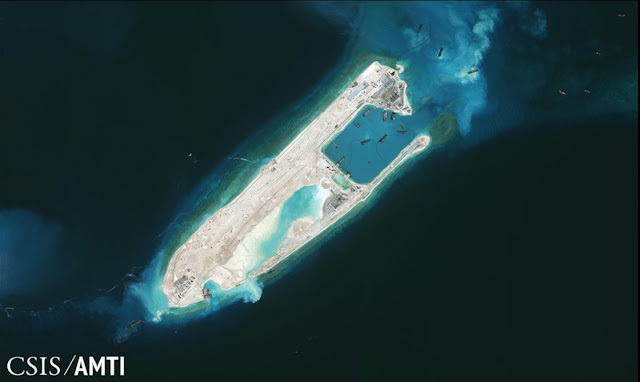 What's new and different now is China constructing artificial islands above oceanic reefs that are barely above sea level during low tide, reefs that are located in waters thus far recognized by all other nations as international, reefs that have their sovereign status in dispute, sometimes among several maritime nations in the vicinity. 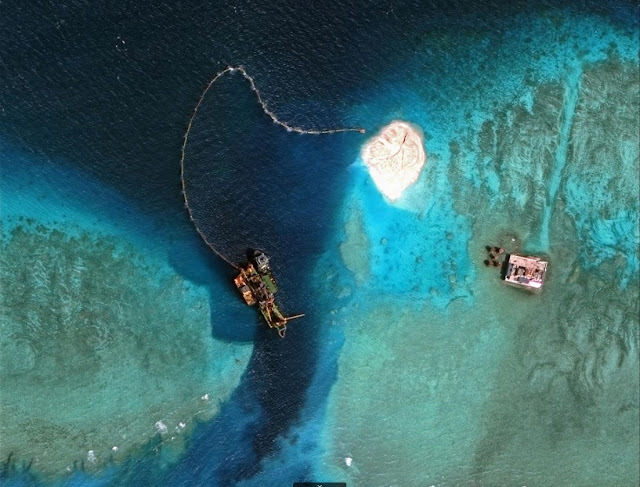 Over the past two and a half years, large scale dredging and land reclamation works had been carried out by Chinese ships and construction crews at various reefs of the Spratly Islands including Cuarteron Reef, Fiery Cross Reef, Gaven Reef, Hughes Reef, Johnson Reef, Mischief Reef, Subi Reef, Sand Cay and West Reef in blatant disregard for international law. Their illegal activities are closely supported by the presence of numerous People's Liberation Army ( Navy ) ( PLAN ) warships as well as the Chinese Coast Guard ships. Access channels to the reefs are dredged and deepened so that dredgers and supply ships can move in close to shore. When sufficient land had been reclaimed, permanent shore facilities like living quarters, communications infrastructure, radar facilities, lighthouses, wharves and jetties, helicopter landing pads and even airstrips have been constructed on the bigger islands. From here, it would not be too hard to imagine gun and missile emplacements on the artificial islands to guard against foreign ships and aircraft. From the Asia Maritime Transparency Initiative ( AMTI ) website, these satellite and aerial photographs tell a hallowing tale of how China had unlawfully transformed a series of idyllic south seas reefs into ugly, polluting man-made concrete islands within a short span of time. 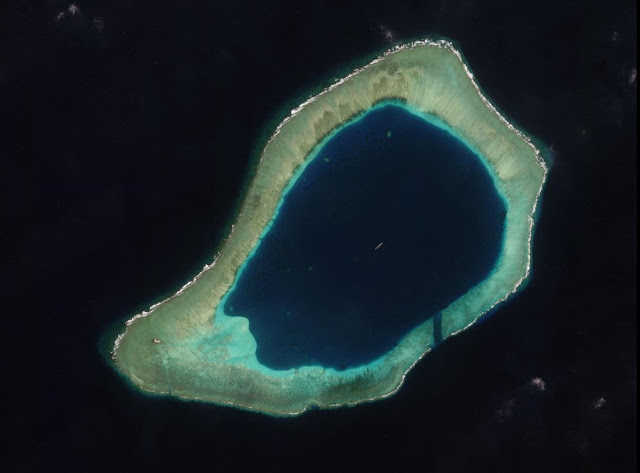 Cuarteron Reef is a coral outcropping located at the western side of the Spratly Islands. 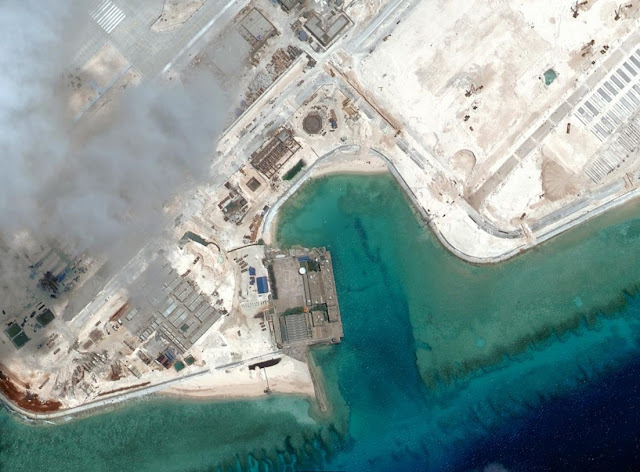 It is China's southern-most and western-most garrisoned outpost in the South China Sea. The reef previously held just a concrete supply platform sticking out of the sea with communications and radar equipment. Since March 2014, or end 2013 according to the Chinese Wikipedia, China has reclaimed some 26000 square metres of land and the process is still ongoing, converting the reef into an island with multiple support buildings including a lighthouse which started operating in Oct 2015.
can be seen in the middle of the reef slightly off-center to the left. A magnified view of the original supply platform at Cuarteron Reef 14th Jan 2014. Cuarteron Reef as it appeared on 24th Sep 2014. An island had appeared where there was none, complete with an access channel. stirred up by the dredging and construction. Source AMTI. An enlarged view of the artificial island at Cuarteron Reef 24th Sep 2014. Fiery Cross Reef is located at the western side of the Spratly Islands and had been occupied by China since 1988 under the guise of a UNESCO sanctioned marine observation post. 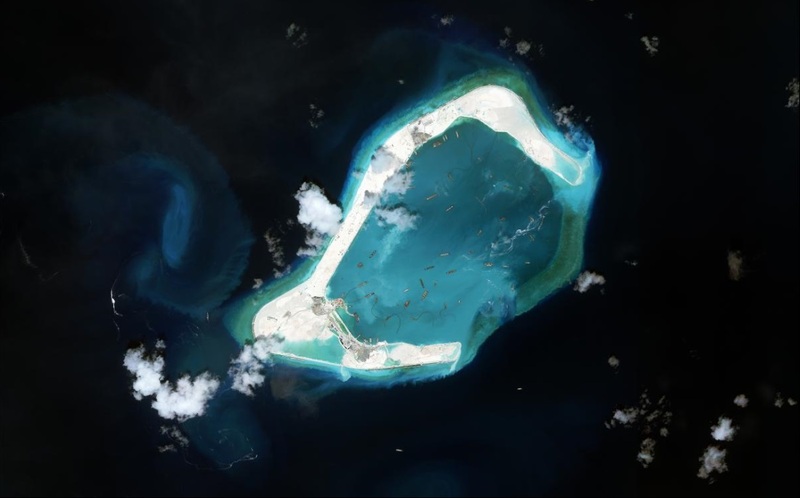 Reclamation works apparently started around Mar 2014 and with approximately 280000 square metres of land reclaimed, the reef has since been transformed into the third largest island in the Spratlys, after Mischief and Subi Reefs. 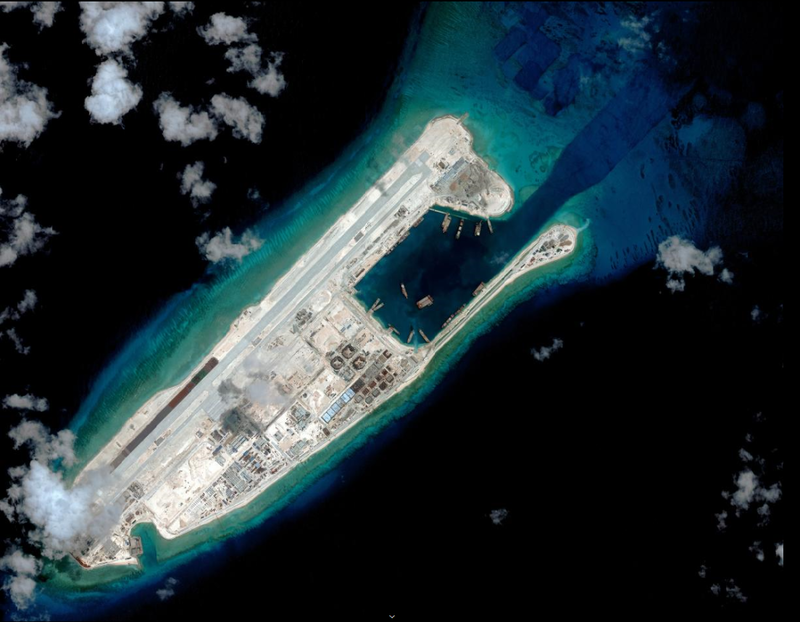 A 3125m long airstrip capable of taking all aircraft types of the PLAN and PLAAF, including the long range H-6 bomber, had been completed a few months ago, effectively converting the artificial island into an unsinkable aircraft carrier. In fact an article on the Chinese internet mil.news.sina.com.cn even compared and boasted about the lower cost of constructing an " island aircraft carrier " versus that of USS Harry S. Truman, an American Nimitz-class nuclear powered aircraft carrier, inflation factored in. 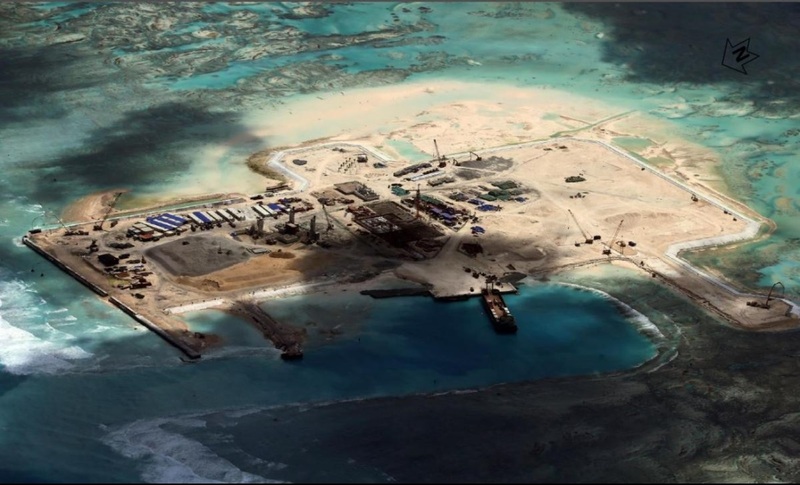 By 3rd September 2015, land reclamation at Fiery Cross Reef is largely completed. A 3125m long runway is clearly seen spanning the long axis of the artificial island. 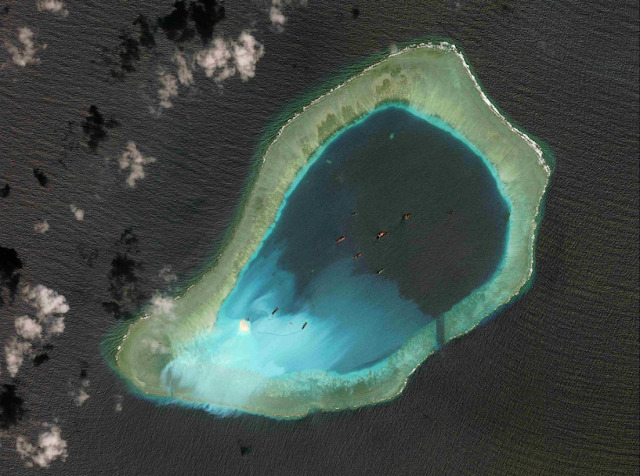 Located at the eastern side of the Spratly Islands, Mischief Reef was originally a low tide elevation with a lagoon. It lies well within the EEZ of the Philippines being only 129 miles from Palawan Island. 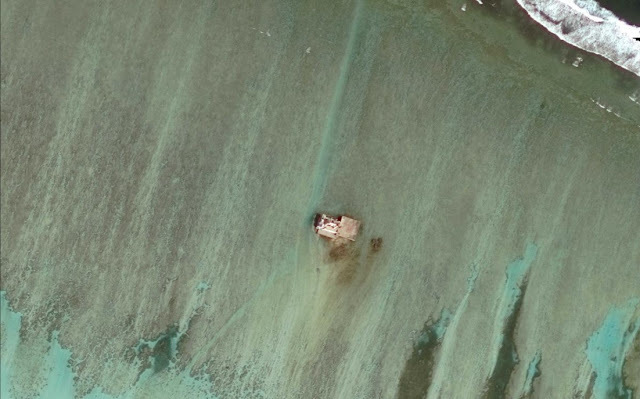 The Chinese muscled their way into the reef in 1994, building structures they claim are for sheltering fishermen. That happened when the Philippines lost their power backing after they stupidly evicted the Americans following the volcanic eruption of Mt Pinatubo. 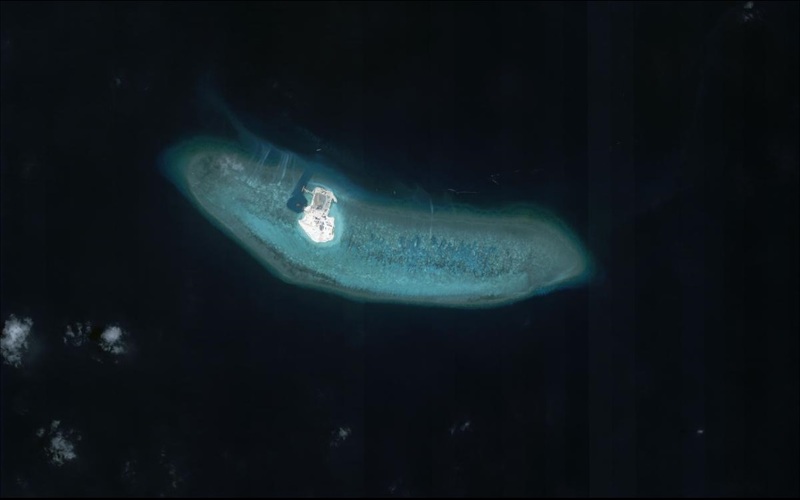 Since early 2015, land reclamation by the Chinese have added some 5580000 square metres of land mass to the reef making it the largest island in the Spratlys. with numerous ships and dredgers polluting the lagoon and surroundings. The original concrete platform at the northern rim of the lagoon. 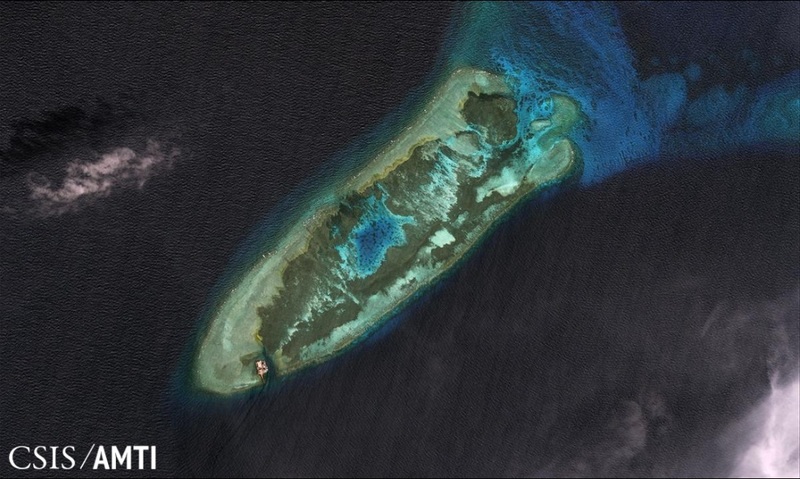 Subi Reef is located at the northern part of the Spratly Islands. 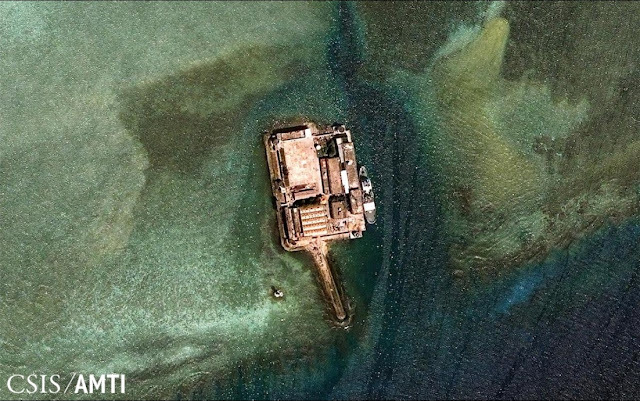 Originally a low tide elevation with a lagoon, it had been occupied by the Chinese since 1988 when concrete platforms were erected on the reef. In Jan 2015 China began large scale land reclamation at Subi Reef and have so far added 3950000 square metres of land make Subi Reef the second largest island in the Spratlys. 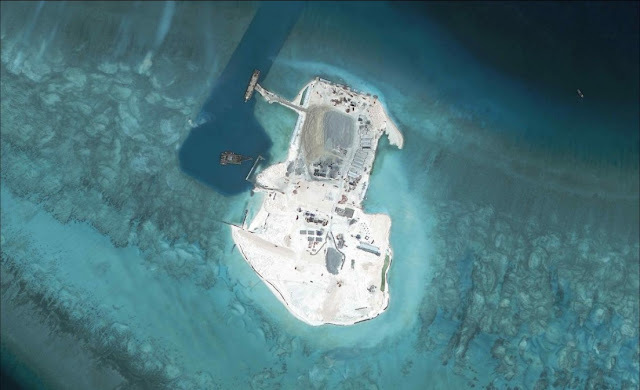 Active land reclamation and island creation by China is occurring at several other reefs in the Spratlys but I think we have seen enough evidence from just the four reefs above. These illegal large scale modification of the environment destroyed marine habitats and had most likely been done without any legitimate environmental impact studies. So the international community may never ever know exactly how much damage had been dealt to the eco-systems of the reefs. Of course China did not just stop after creating these artificial islands. It had also built all sorts of infrastructures to support the continuous presence of both the military and the civilian population as we have seen in the photos above. It had actively promoted cruises and tours to the islands and had already tested its airstrip with the landing of civilian jetliners and military aircraft. 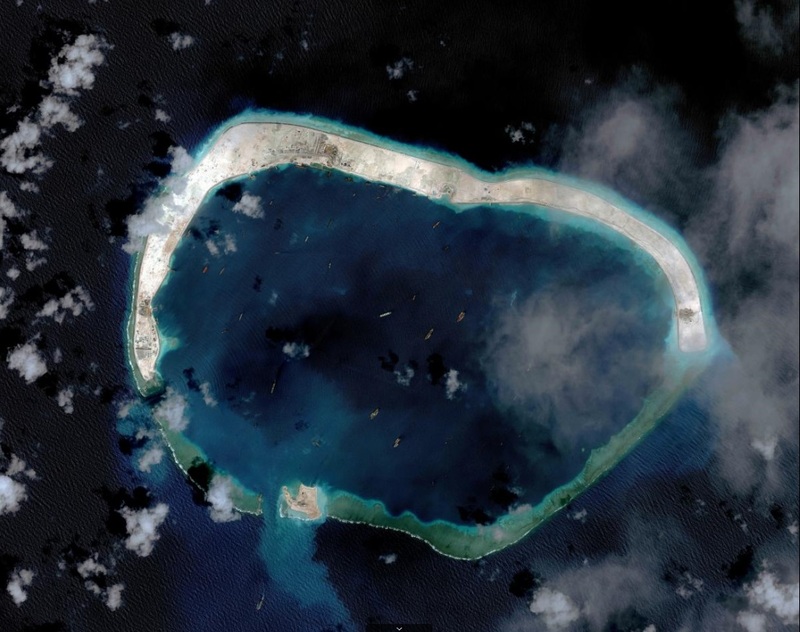 It had militarized the islands, with satellite imagery revealing that HQ-9 advance surface-to-air missile systems had been installed on Woody Island of the Paracel group in Feb 2016. 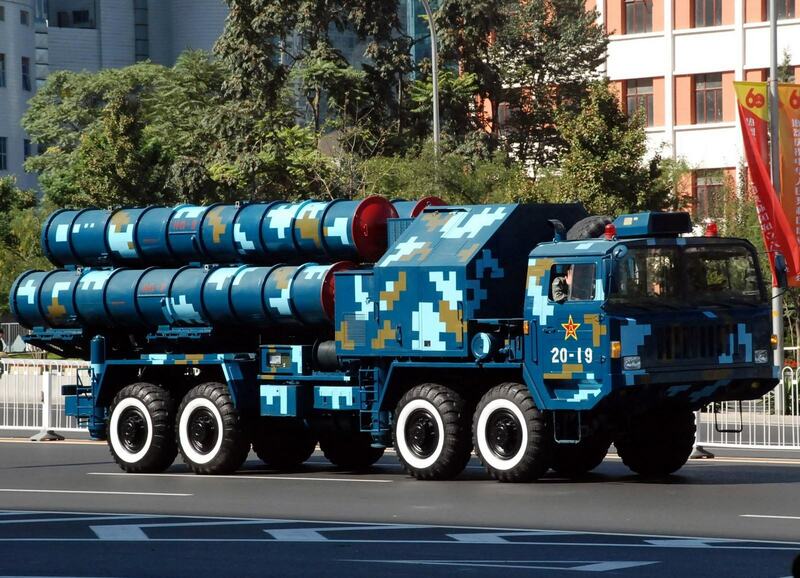 The HQ-9 has a range of 200km and has a capability similar to the Patriot missile system of the US. The following month, reports indicate the YJ-62 advance anti-ship cruise missiles had also been deployed on Woody Island, potentially threatening ships within a 400km radius. All this events were taking place even though China's Premier Xi Jinpin had promised not to militarise the SCS. But this breaking of promises is nothing new to China. In 2002, it signed a joint declaration with the ten-member ASEAN states in which parties undertook to exercise " self-restrain " in the SCS and to refrain from occupying uninhabited structures such as reefs. That has all been thrown to the winds with China's recent island creation ventures. So China can never be trusted and its words are not worth the paper they are written on. To make matters worst, China has been quietly subverting members of the ASEAN organization, courting members that are somewhat sympathetic to its course like Laos to forestall any joint declaration against its actions in the SCS. For the past few years, the ASEAN Defense Minister's Meeting Plus involving the 10 ASEAN members and 8 other nations including the US and China had been unable to come into consensus to issue a joint declaration regarding events in the SCS, largely due to the objections and interference of China. Member states probably worry about trade relations with China since China is the top trading partner for many ASEAN countries. ASEAN has become such an impotent organization that it risk becoming another United Nations. Historically, China's modus operandi was to patiently wait for an opportunity in the form of a power vacuum and then move in swiftly to displace an existing occupant. Once that was achieved, it would again lay low and wait for the international community to forget or lose interest about the original territorial seizure and then build up and naturalise its newly acquired territory by immigration and infusion of military troops. Before and during WWII, the Chinese were having their hands full fighting the Japanese on the Chinese mainland. Shortly after the end of WWII, the Nationalist government then in power claimed the entire Paracel, Spratly and Pratas island groups from the surrendering Japanese and even occupied some of these islands from late 1946. In the civil war that followed, the Nationalists were defeated by the Communist and retreated to Taiwan Island where they founded the Republic of China in 1949. The Communists took control of the mainland and formed the People's Republic of China, also in 1949. In the initial few years, communist China was probably too weak to exert any influence beyond its shores. Its navy was largely a riverine and coastal force comprising of torpedo boats, mine sweepers and fast attack crafts. However, with the French defeat at Dien Bien Phu in 1954 signaling the end of French colonialism in Indochina, China began to occupy half the Paracel Islands, with South Vietnam occupying the other half. The next decade saw US Forces backing the South Vietnamese government in their struggle against the communist north in what we now know as the Vietnam War. As the war progressed and the Americans started their gradual disengagement starting from 1973, China moved in and occupied some of the Paracel islands claimed by South Vietnam. In the ensuing Battle of the Paracel Islands in Jan 1974, the South Vietnamese forces were defeated and China gained complete control of the islands. The Vietnam War ended in 1975 and with the withdrawal of the Americans came the Soviets. However, Soviet presence in Vietnam started to decline in the mid-eighties as the Cold War neared its end. 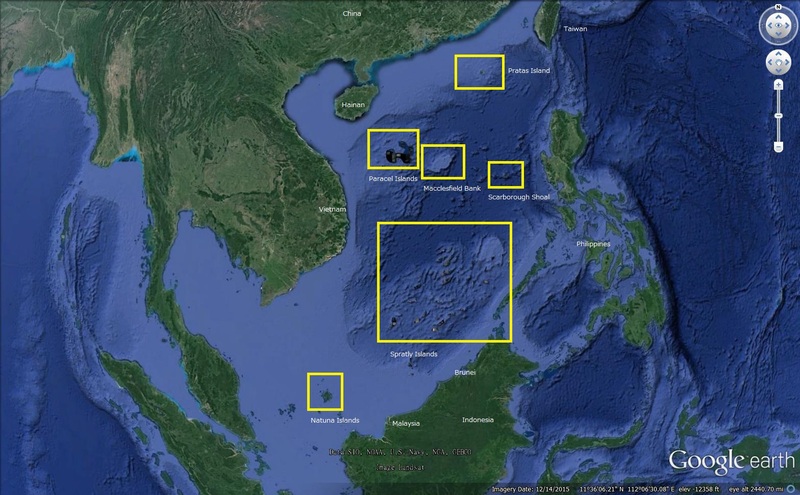 So China began foraging into the Spratlys, with 14 islands ( but not the reefs and low tide elevations ) all already occupied by the Philippines, Taiwan and Vietnam. It did so initially by stepping up its naval patrols, but by 1987 had tricked UNESCO scientists who were not quite politically savvy to allow it to build an oceanic observation post at Fiery Cross Reef. 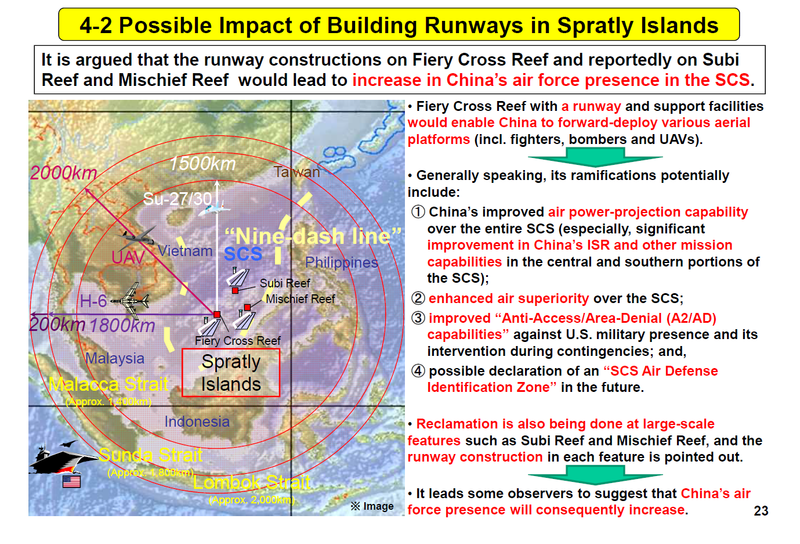 It then went on to build structures on several other reefs in the Spratly group. In 1991, the eruption of Mt Pinatubo destroyed the American naval base at Subic Bay and also the nearby Clark Air Force Base, an unfortunate natural disaster. But what followed was the Philippine's refusal to allow anymore permanent US presence on their soil, a monumental manmade disaster. 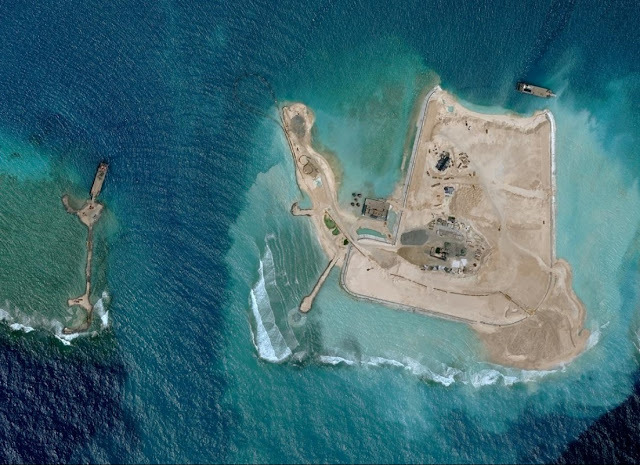 With the Americans gone, the Chinese started building structures at Mischief Reef of the Spratlys around 1994, ignoring the protests of the Philippines. 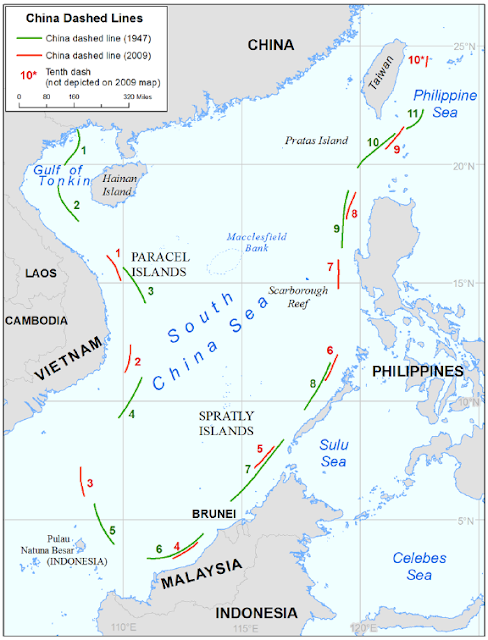 In the 2000s, Chinese naval and commercial fishing fleets are increasing encroaching on EEZ and even territorial waters south of the Spratlys. The fishing boats are frequently escorted by the Chinese Coast Guard, using vessels of monstrous dimensions. 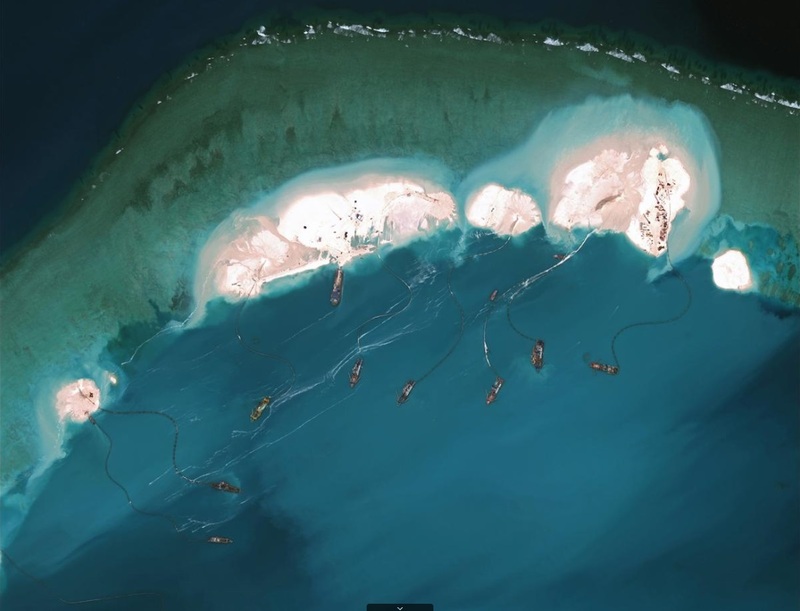 By 2012, China had bullied and tricked the Philippines into giving up Scarborough Reef. 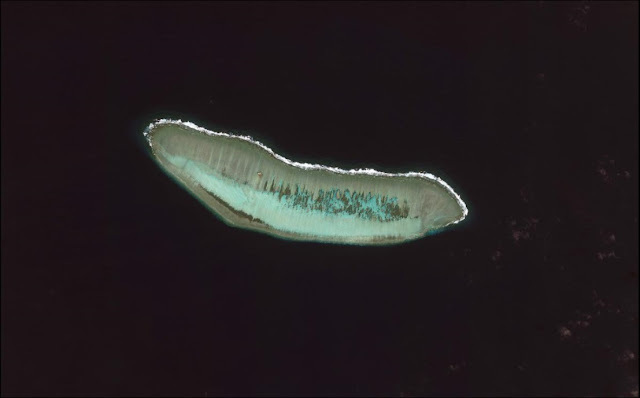 During a standoff between the two navies at the reef, the US mediated to have both parties back down until a deal over the ownership of the reef could be reached. 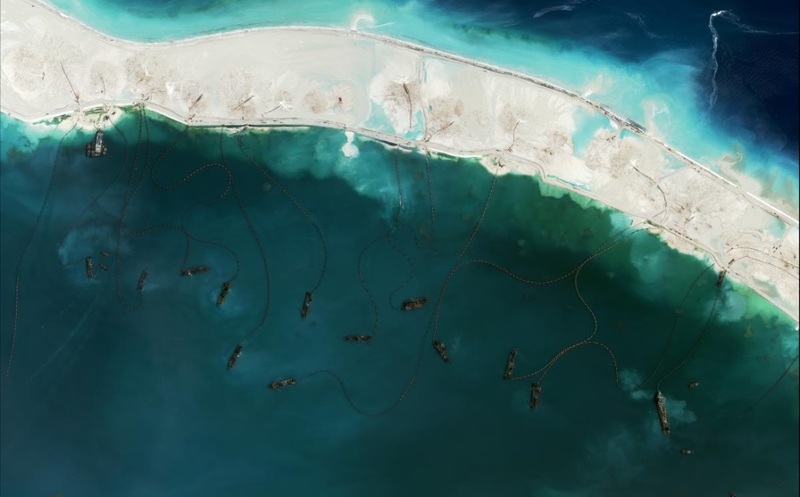 The Filipino forces complied and withdrew but Chinese reneged on their promises and never left, instead continuing to strengthen their presence and militarizing the shoal. From Dec 2013, emboldened by its increasingly powerful Navy and Coast Guard, the Chinese have disregarded international opinions and started large scale dredging and land reclamation around many reefs and low tide elevations in the South China Sea, creating artificial islands where there were previously none. These activities were nicely summed up by the Japanese MOD publication " China's Activities In The South China Sea " released in Dec 2015 ( see below ). 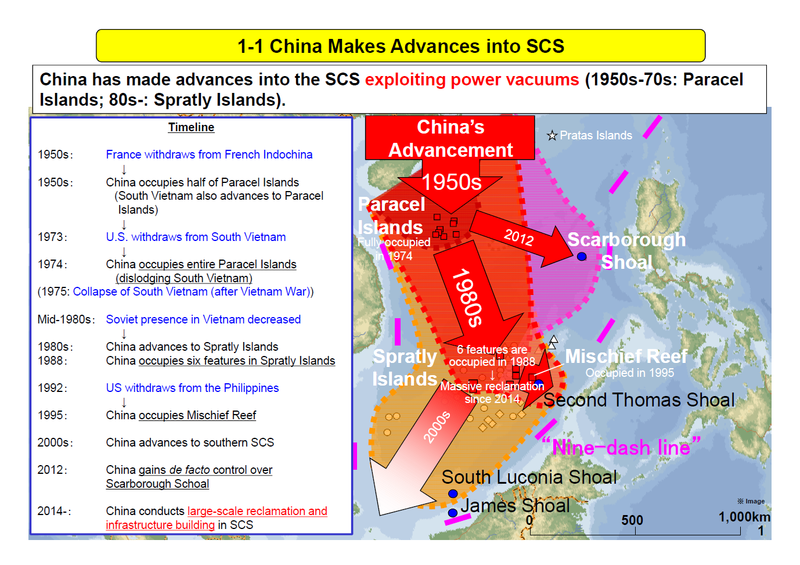 From the Japanese MOD Publication " China's Activities In The South China Sea "
China is rapidly progressing towards total military control of the South China Sea through its years of systematic occupation of the various island groups. With the completion of a 3000m paved airstrip on Fiery Cross Island right in the middle of the SCS, long range H-6 bombers with a strike range of 2000km and Su-27 Flanker type fighters could dominate the entire SCS and beyond, potentially denying sea and air access to other nations should it wish to, in military parlance, A2AD ( Anti-Access / Area Denial ). Once that was achievable, the next possible progression might be a declaration of an Air Defense Identification Zone ( ADIZ ), just as China did over the East China Sea in 2013, unilaterally and without prior consultations with its neighbours or the international community. The United Nations is absolutely powerless to act against China's illegal activities in the SCS since China is a permanent member of the Security Council and could therefore veto anything against its interest. The ten members of ASEAN together could have made their voices heard if only they could be united and speak as one. In reality, there exists lots of in-fighting and mistrust among member states resulting in an organization without bite. Russia is in cahoots with China and doesn't give a damn as to what's happening in the SCS. In fact it is itself land grabbing in Europe with the annexation of Crimea and the invasion of eastern Ukraine. 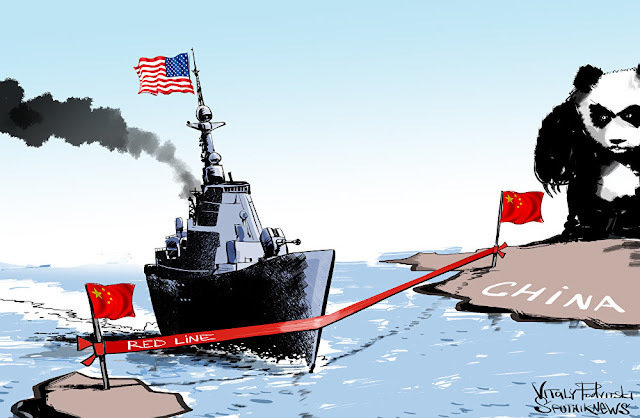 The world is therefore left with the United States as only country that could interfere with China's ambitious moves in the SCS. It could be said that even such FONOPs are of not much use and had so far done nothing to change China's behavior, but it is a start. Critics even say that such activities might provoke the Chinese to intensify the militarization of the SCS. America should do more than just asserting its right of innocent passage but with an outgoing Lame Duck president and the uncertainty of a presidential election looming at the end of the year, don't expect US policies to change in any drastic manner anytime soon. 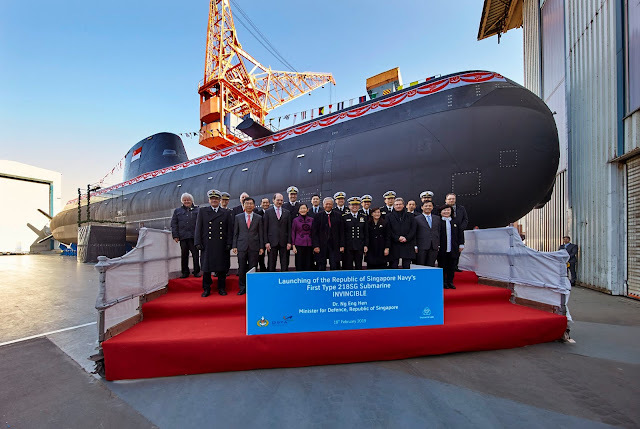 If other countries in the Pacific Rim like Australia, Japan, ASEAN and other littoral states around the SCS could conduct joint FONOPs with the USN, that may send a stronger message to China that its illegal activities are being scrutinized by the international community. Maybe all the claimants involved in the South China Sea maritime dispute should follow the example of the Philippines and take China to court. The ruling by Permanent Court of Arbitration in the Hague on the case brought about by the Philippines against China concerning among other things the legality of its Nine Dash Line claim will be due by next week on 12th Jul 2016. If there is anything China feared, it is probably an unfavorable outcome in an international legal court. It had refused to participate in the arbitration hearings and repeatedly said that it will not abide by the rulings. It tried all sorts of tricks to intimidate the Philippines, including scheduling a large scale military drill in the South China Sea from 5th to 11th Jul, closing off an entire area between Hainan Island and the Paracel Islands. But on the quiet, it had approached the Philippines and said that it is ready to start negotiations on South China Sea-related issues including joint exploration of resources if the Manila were to ignore the arbitration rulings. Ignore the rulings? Then why bother to initiate the arbitration in the first place? That's by far the most absurd suggestion to come from China, and that's probably because they are already scared shitless just thinking about the possible outcome of the arbitration. China knew very well that its actions in the South China Sea all these years were illegitimate and it is afraid of an international backlash and condemnation that will surely come should the Court of Arbitration rule against it. It had single-handedly triggered an unprecedented arms race across every country in East Asia and South East Asia in recent years that is still ongoing and maybe even accelerating. It is time to stop this madness. A seismic change is about to come to the South China Sea this week, and I have the strongest premonition that China is not going to like it. The Permanent Court of Arbitration at The Hague had released its long awaited verdict on the Philippines vs China case yesterday ( 12th Jul 2016 ). Press release can be read here. 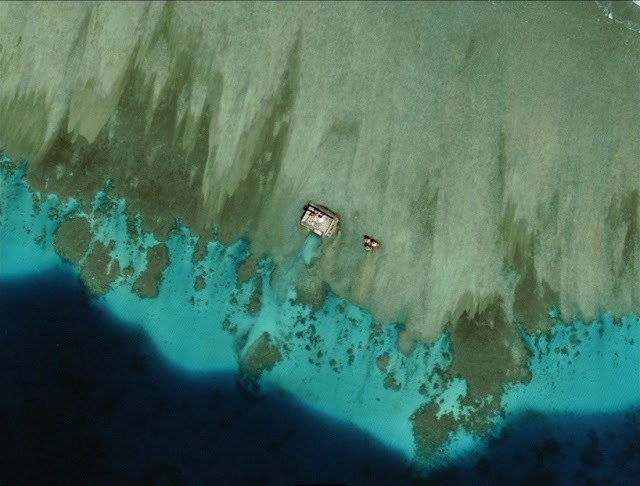 It had confirmed what most of us had already knew, that China's claims in the South China Sea is ILLIGAL and without basis and that its island factories had severely degraded the reef ecology of the SCS. Though the rulings are legally binding for both parties involved, the PCA does not hold any enforcement powers. The World will be watching very closely what happens next. Congratulations to Xi Jinping, you have just been officially bestowed the double titles of the World's foremost Big Bully and Petty Thief by the United Nations. That is what the PCA verdict is essentially trying to say, in layman's terms.